There was a man on Radio 4 this morning talking about crop circles. Michael Glickman, his name was. An architect, he was plugging a book about the phenomenon subtitled "The Bones of God". Richard Coles listened patiently - as a vicar, he's used to humouring obsessives, I'll guess - to Glickman's empassioned insistence that crop circles cannot be the work of mere human beings. Glickman has been studying the "phenomenon" for 21 years, during which time he had been "swimming in waters of absolute denial, scepticism, refusal to look." "I've been an architect, I've worked in engineering... I used to pride myself on knowing how everything was made. I entered this one and realised immediately that it was beyond human agency, something I've become more certain about as the years have gone by." Glickman considered that the elaboration and elegance of some crop designs could be rivalled only by "twelve lace-making Belgian nuns" - an interesting benchmark, since I assume he doesn't consider Belgian nuns hail from a far-off galaxy. Coles put it to him that the increased complexity and perfection of form, as the years went by, might be the result of "a group of artists working on their art," but Glickman was having none of it. The designs were "simply breathtaking" and he wondered who these "enormously secret, enormously gifted" artists might possibly be. Known man-made creations, by contrast, were "crummy". We are to believe that these enormous events... appear apparently in moments, flawlessly, without ever a correction or amendment. The fact that we have no explanation does not entitle us to cast the phenomenon aside as simply a joke, which is how the media and the pubic have treated it for so long. True, there is no "evidence" available, he admitted. "But then we live in an era of scientism, the rules of which simply won't encompass a whole series of phenomena which are simply brushed aside, one of which is the crop circle." The hoax claimants say they simply stomp it down with a board... but the detail of the true crop circle is breathtaking, the surge, the flow, is simply of a scale that is unimaginable by a simple stomping down, [the patterns are] so varied, so particular, so meticulous that it is simply unimaginable that it is done by humans. What the crop circles are telling me is that there is somewhere an intelligence superior to our own, further evolved than our own, and it seems to be gently pushing love letters under the door... not landing metallic craft on the White House lawn but dealing more gently, more lovingly with mankind. 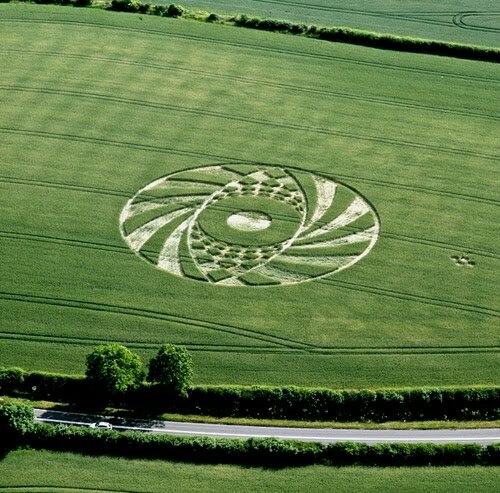 Needless to say, I have no doubt that all crop circles, however intricate in design, that actually appear in fields, are made by human beings. I'm not entirely convinced that all apparent crop circles truly exist - some might be computer-generated, if only because using CGI takes a lot less effort than stomping around a field. Neverthess, any formation that can be designed and plotted out can in principle be reproduced on a field of wheat. All that is required is desire to do it, patience, and mastery of a few basic skills. It is quite puzzling that these artists are happy to work so hard anonymously, with their sole reward the possibility of seeing their creations filling some vacant space in the Daily Mail, but I don't doubt their existence on that basis. It's possibly a fun way of spending a summer evening. If anything needs explaining, it's not the circle makers' motivation but rather the selective incredulity of people like Glickman. 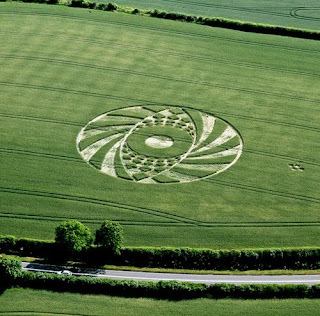 Beautiful as they are, there's nothing inherently mysterious about a crop circle. At the end of the day, it's just a pattern in a field. Glickman has a website. Has it not occurred to him that the technology that enables him to disseminate his views about crop circles to a wider public is many orders of magnitude more complex and hard to understand than his pet obsession could ever be? Glickman ascribes crop circles to a "superior intelligence" on the basis that he finds their intricacy baffling. But what of his mobile phone? Is that not infinitely more amazing than any crop circle? Yet neither he nor any other "crop circle researcher" imagines that an iPhone is extraterrestrial in origin. How can something so extraordinary be taken for granted, while something as rudimentary as a crop circle is seen as beyond human capacity? The only solution I can offer to this rarely-posed riddle is that it is the very simplicity of the crop circle that makes it seem preternaturally impressive to people like Glickman. For the same reason, in the era of the Apollo moonshot there were many people who, following the lead of Erich von Daniken, found it impossible to believe the ancient Egyptians capable of building the pyramids of Giza. A pyramid is basically just a pile of rocks. You can imagine building one - or, rather, you can imagine trying to do it and failing miserably. Similarly, you can imagine stomping around in a field late at night, trying to create a crop circle, and producing only an embarrassing mess. In both cases, the technology is so basic that the beauty or size of the results can seem to some people superhuman, simply because it would be beyond them. Whereas the technology hidden inside an iPhone is so far advanced that most people simply wouldn't know how to start failing to build one. It's still odd, though. I can tap out enough of a tune on a piano for my mind to boggle at the skill exhibited by Andras Schiff or Michiko Uchida. How can a human hand, I ask myself, create such sounds, such emotion, just by tapping the black and white keys? It is certainly way beyond the capacity of most human beings. Concert pianists are not alien beings, though. Would Michael Glickman consider their skill inferior to that demonstrated by a maker of crop circles?